We are pleased to share with you our latest Insight. The gradual reversal and re-legalization of cannabis by state governments commenced with California’s medicinal legalization in 1996 and put the plant back in play as a legitimate source of commerce and human utilization. 29 states (plus DC) now have laws permitting medicinal cannabis use and seven states have also legalized recreational use. 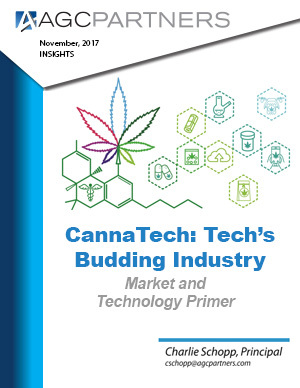 With $7B in spend in 2016, the cannabis space is still considered “fledging” and sets up as the largest and highest growing consumer market to come along since the commercialization of the Internet. In total, 60% of the US population is now part of the state legalized cannabis TAM. Despite the meteoric growth, cannabis is still federally illegal and plagued by complex regulations, market-to-market nuances, and operational inefficiencies. Out of this chaos, a homegrown ecosystem of technology companies has sprouted, tailor-made to address the challenges of the cannabis space. This report takes a closer look into the major trends and players in the ecosystem as well as recent M&A and financing activity.